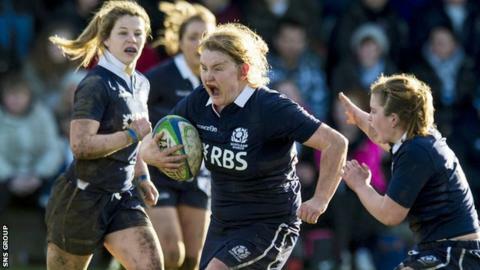 Scotland are aiming to be "more competitive and more physical" in this year's Women's Six Nations, says head coach Jules Maxton. The Scots have not won a Six Nations match since an opening weekend success against France in 2010. And this year's tournament opens against the French on Saturday. "Last year we had possession but could not turn that into points, so that's an aim for us in every game," Maxton told BBC Scotland. Increased investment from Scottish Rugby has improved preparation for the part-timers, who start as firm favourites for a fifth consecutive Wooden Spoon. "We've already seen an increase in the amount of time we can spend with the players," explained Maxton. "There's also been greater support for strength and conditioning and the nutrition side of things. "Hopefully, we can see the impact of that in this campaign." Tracy Balmer admits it has been hard captaining a side that has scored just one try in the last two Six Nations tournaments but the Worcester prop is sure Scotland are on the right path. "It's hard because you start to believe your own press," she revealed. "To come out of that, you just need to ignore it. "We started off from a very low place. We've been building and at this level the changes are going to be minimal. "Everyone else is changing too and at the same rate, if not faster sometimes. "Last season the other teams were aiming to peak for the World Cup, whereas we weren't involved. For us, our timing has been slightly off. "We haven't been great at converting our pressure into points. But that's starting to change and you can feel it in the squad. "We've had three really competitive gamed in the run up to this campaign and we managed to score two tries against a really stacked Nomads team - they had over 100 caps between them. "We scored a fair few tries against the Irish Exiles and we had so much ball against Italy we were perhaps surprised and we just couldn't secure something from that one. "We know we are better and that we can score tries. It's just about going out and doing it."